Malaysiakini : COMMENT | He was a former suburban footballer who had helped manage a jail for young offenders before starting his own window and door company in Melbourne. Like all fathers, he doted on his son, Cooper. During the summer break, the young man asked the father for some money to travel for an inter-state football carnival. John Bond had nothing to give – he was broke. All his money had been used to supply and install windows and doors in a downtown building in Melbourne in 2013. Having worked on the development to almost completion, his company, Trubuilt Properties, did not get paid. Neither did his workers and dozens of other contractors. They were left in the lurch and the owners of the building slipped away to Malaysia. Three Malaysians –Azizi Yom Ahmad, Abdul Ghani Yusof and Dennis Teen together with Australians, Peter Mills and Chris Dimitriou, had set up a company – Wanissa Properties – to sell Dudley House to Mara for A$17.8 million but inflate the price to A$22.5 million. 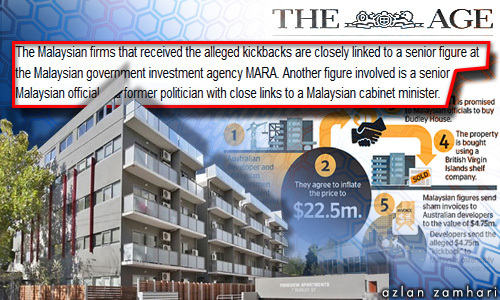 Court records show that Henzel discovered an email dated March 2013 in which Mara agreed to buy Dudley House – to be used as a hostel for Malaysian students – and a payment of “AUS$4,785,000 in the form of introduction and consultancy fees” would be wired to a mysterious Singapore shelf company.